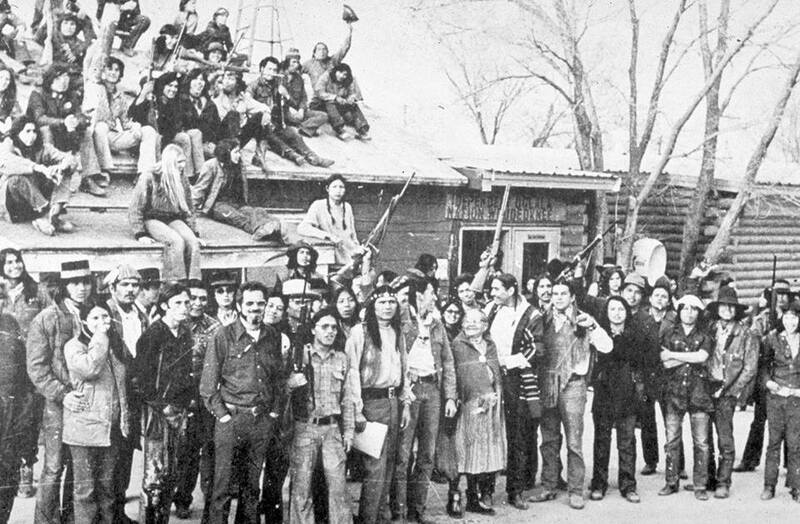 In the summer of 1968, two hundred members of the American Indian community came together for a meeting to discuss various issues that Indian people of the time were dealing with on an everyday basis. Among these issues were, police brutality, high unemployment rates, and the Federal Government's policies concerning American Indians. Little did anyone know that AIM would become instrumental in shaping not only the path of American Indians across the country, but the eyes of the world would follow AIM protests through the occupation at Alcatraz through the Trail of Broken Treaties, to the final conflict of the 1868 Sioux treaty of the Black Hills. This conflict would begin on February 27, 1973 and last seventy-one days. The occupation became known in history as the Siege at Wounded Knee. It began as the American Indians stood against government atrocities, and ended in an armed battle with US Armed Forces. Corruption within the BIA and Tribal Council at an all time high, tension on the Pine Ridge Indian reservation was on the increase and quickly getting out of control. With a feeling close to despair, and knowing there was nothing else for them to do, elders of the Lakota Nation asked the American Indian Movement for assistance. This bringing to a head, more than a hundred years of racial tension and a government corruption. On that winter day in 1973, a large group of armed American Indians reclaimed Wounded Knee in the name of the Lakota Nation. For the first time in many decades, those Oglala Sioux ruled themselves, free from government intervention, as is their ancient custom. This would become the basis for a TV movie, "Lakota Woman" the true story of Mary Moore Crowdog, and her experiences at the Wounded Knee occupation. The forces inside Wounded Knee demanded an investigation into misuse of tribal funds; the goon squad's violent aggression against people who dared speak out against the tribal government. In addition they wanted the Senate Committee to launch an investigation into the BIA and the Department of the Interior regarding their handling of the affairs of the Oglala Sioux Tribe. The warriors also demanded an investigation into the 371 treaties between the Native Nations and the Federal Government, all of which had been broken by the United States. After 71 days, the Siege at Wounded Knee had come to an end; with the government making nearly 1,200 arrests. But this would only mark the beginning of what was known as the "Reign of Terror" instigated by the FBI and the BIA. During the three years following Wounded Knee, 64 tribal members were unsolved murder victims, 300 harassed and beaten, and 562 arrests were made, and of these arrests only 15 people were convicted of any crime. A large price to pay for 71 days as a free people on the land of one's ancestors.